Paris (AFP) – Arctic sea ice last month was around 50 percent higher in volume compared with a year earlier, following a recovery in area this summer, the European Space Agency (ESA) said Monday. This is some good news for the Arctic, but does not reverse a longer trend of decline, it said. Data from ESA’s high-tech ice-monitoring satellite CryoSat found that in October this year, there was about 9,000 cubic kilometres (2,100 cu. 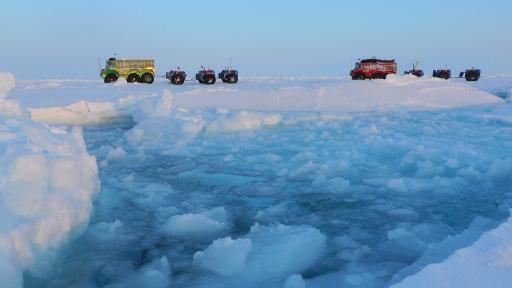 miles) of sea ice in the Arctic. A year earlier, the volume was 6,000 cu. kms (1,400 cu. miles). When measured over a timescale of several years, ice in October 2013 was about 30 centimetres (19 inches) thicker than last year’s — a rise of about 20 percent. Sea ice is ocean water that freezes in extremely low temperatures. In the Arctic, this ice goes through regular swings, contracting in the northern hemisphere’s summer and expanding in its winter. As a result, the changes are considered a bellwether of global warming, although experts also warn that only decades-long data can show whether something is a trend — meaning a man-made shift in climate — rather than a blip in the weather. The sharp recovery in ice thickness is a surprise given the Arctic’s loss of ice in terms of area in recent years, said Rachel Tilling, from Britain’s Centre for Polar Observation and Modelling. In 2012, the area of sea covered by ice in the Arctic during the summer reached a record documented low. But in 2013, this recovered somewhat, to the sixth record low. “We didn’t expect the greater ice extent left at the end of this summer’s melt to be reflected in the volume,” she said in a press release issued by ESA. The increase in volume is welcome, but does not reflect a reversal in the long-term decline, the scientists said. “It’s estimated that there was around 20,000 cubic kilometres (4,800 cu. miles) of Arctic sea ice each October in the early 1980s, and so today’s minimum still ranks among the lowest of the past 30 years,” said Andrew Shepherd, a professor at University College London, a co-author of the study. The data was presented last week at a meeting of American Geophysical Union (AGU) in San Francisco, California, the agency said.